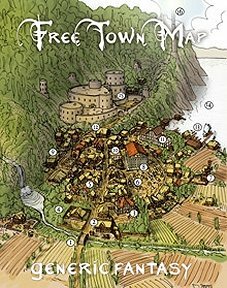 Publisher's blurb: "Town map for a generic medieval fantasy setting. "Free for personal, non-commercial use! "High-res PDF with two layers: the map itself, along with a description of major locations. Optionally, this layer can be turned off, and the map printed out without the pre-made descriptions, leaving it up to you to add your own!"